Galle, previously known as Gimhathiththa, is a city located on the southwestern tip of Sri Lanka. It was occupied by the Portuguese in the 16th century and the Dutch who followed from 1649. It was the Dutch who built the fortified walls of Galle Fort, that is now a world heritage site. Trading in spices, predominantly cinnamon, the port historically had bustling trade with many Asian and European centers but these days you're more likely to see fishing boats on the shoreline than the galleons of old. 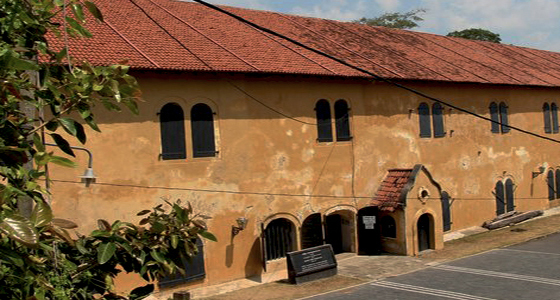 There remains a Mercantile Seaman Trading Institute in Galle, which links back to the former trade roots. The largest percentage of the resident population are Sinhalese and the next greatest are the Moors. The ethnic mix of cultures makes for a wonderfully atmospheric historic walking tour of the Galle Fort area. The welcoming warmness of the locals is infectious and it is very easy to see why many foreigners choose to settle here. The Maritime Museum sits above the Old Gate and is housed in a Dutch warehouse that was built in 1671, part of which is built into the ramparts of the fort. The building suffered great damage by the 2004 tsunami, with flood water reaching over two meters. Sadly a great many artifacts were lost forever. Our recordings took place during the day time, which in many museums would unsuitable, however apart from one local couple who departed promptly and staff on a lower floor, we had the exhibition halls exclusively to ourselves. Background noise was minimal apart from the tooting of tuk tuks and a call to prayer towards the end of the session. We were unexpectant of achieving good results with the recording because of the lack of environmental controls in a large area, however we were delighted. Oddly all EVP were in English, with a small percentage being communicators that have been recorded in the UK. The clips below were captured at The Maritime Museum and are featured in the video along with a selection of EVP from a seance sitting at our residence in Wadduwa. EVP 1: Rachel is reading aloud the translation of a motto that features on a crest of arms in the second exhibition hall. EVP 2: Rachel and Tracey are in the entrance hall looking at a scaled model of the Avondster, which was built by the British, captured by the Dutch and sunk in Galle harbour. EVP 3: Tracey asks for information regarding an anchor she sees in the first exhibition hall when the voices are captured; whilst they are not very clear, the contents of the messages are interesting. EVP 4: Rachel has fun when she spies an enormous anchor on the lower floor of the museum, it reminds her of a favorite song. EVP 5: Just before you exit the Maritime Museum, you come to a gift shop. Unfortunately we do not know who Berty is or who said open the door, a door that Rachel was determined to walk into.